After spending the last twelve weeks floating in the warm, comfortable ether of the reflation trade, markets received a rather rude awakening on Friday. Part of it was down to the birth/death model-assisted “good” print in non-farm payrolls. Part of it was down to comments from Atlanta Fed president Lockhart that the FOMC could start raising rates while still pursuing QE/credit easing. And part of it was down to good old-fashioned momentum trading. Regardless, the outcome was carnage in the fixed income market. One didn’t have to look too hard to find 5+ sigma events in the Treasury market. 2 year yields rose 34 bps and the 2-10 curve flattened by 22 bps. According to one of Macro Man’s bookies, those represented six- and eight- standard deviation moves, respectively. Or was it the reverse? 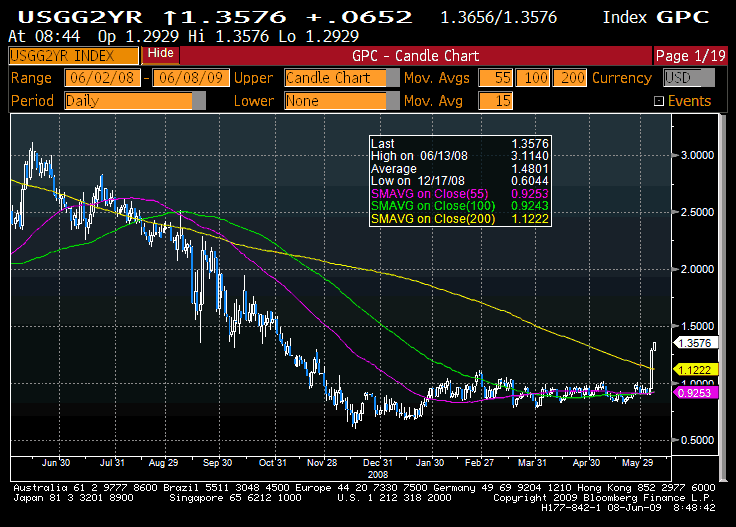 Regardless, the move has continued today, with 2y yields rising another 6 bps and the curve flattening a bit more. Remarkably, markets are now pricing in Fed hikes by year-end (Dec Fed funds contracts are 33 bps below front-month), while yield expectations in 2010 (“the reds”) have risen dramatically. Probably unsurprisingly, other markets have not taken this new rise in yields terribly well. Equities have been limp since the NFP number was released, though given the back-up in yields one might say that they could have traded worse. Still, the Eurostoxx and SPX are both perched just above the 200 day moving averages…a break back below, combined with a continued fixed income sell-off, would surely embolden what bears have managed to survive the recent cull. A more telling impact has been found in FX, where punters have once again found that the one-way bet against the dollar isn’t all it’s cracked up to be. The DXY has broken back above its downtrend line, and it sureloy won’t be long before momentum followers get stuck in. Taking a step back, however, Macro Man cannot help but wonder if this fixed income carnage isn’t sowing the seeds of its own destruction. After all, what’s the likely asset allocation flow if equities sag and the dollar suddenly looks like it isn’t going down the swannee after all? One might reasonably conjecture that Treasuries would see some inflows. Valuations at the front end already look attractive; one can already take a bet in options space, offering even odds, that the Fed won’t put rates up this year. That doesn’t look like a bad bet. Morever, if we look at the past couple of years we can observe a landscape littered with similarly violent moves that ultimately came to naught. Bizarrely, nearly a year ago to thew day, eurodollars sustained a downdraft of similar magnitude to that observed three days ago. To be sure, the circumstances were not identical- eurdollars had been drifting lower for some time last year- but the tone of the market (panicked selling/forced liquidation/momentum jockeys piling in) was eerily similar. This was a distinctly unpleasant environment if you were caught long or trading RV. 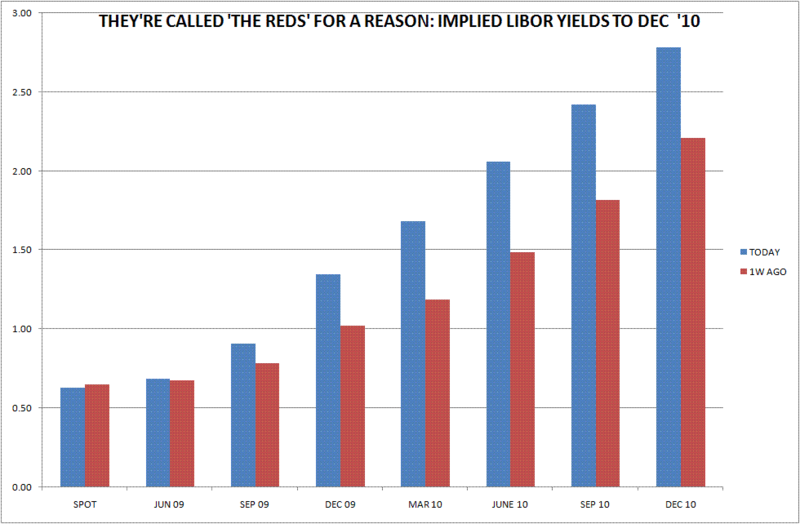 Yet a week later, implied yields topped out and began an inexorable decline that reversed the carnage before the shenangians of last September. And so Macro Man wouldn’t be altogether surprised to see a similar outcome this time around. Sure, markets can always sell off more. But we know the Fed’s watching, and, perhaps even more importantly, so are other markets. One could argue that Friday’s price action was the logical eventual outcome of the “green shoots” theme. Now, the theory gets a more serious test. Like many sceptics, Macro Man suspects that it will be found wanting.